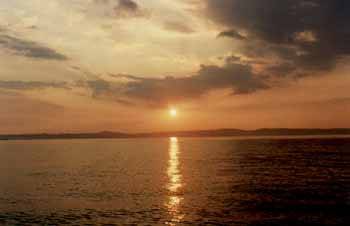 Paignton is one of the most popular resorts on the South Coast of England, renown for it's fishing and diving. It is easy to get to by road and rail. Directions and links to relevant sites are given below. From London and the South East you can take either the M4, or for a more scenic journey passing Stonehenge, the A303. Both roads will take you on to the M5. From the North and Midlands take the M6 or M1/M42 to join the M5. Drive south on the M5 to Exeter than take the A380 to Torquay and then the signs to Paignton. Follow the directions for the town, then the Harbour. 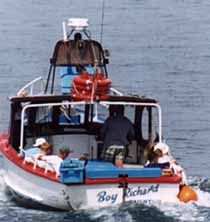 The Boy Richard office is located close to the Harbour Lights Restaurant. Click Here for a close up map of the area (in a new window) around the Harbour, to help you find it. Click Here for an expanded map of the Torbay area. Paignton Station is part of the mainline network serving the South West and Cornwall. There are also many services that stop at Paignton from the Midlands and the North. Visit thetrainline.com for tickets and prices. There are many Coach services to Paignton. National Express Coach Services (also Britbus.com) operate efficient coach services from most parts of Britain to Torbay. Coach travel is cheaper than rail and you can buy Brit Express Travel Card from your travel agent before you depart.